Potato fry recipe is a veg stir fry recipe and a common side dish in every indian household made with diced or sliced aloo. The aloo fry is a quick and easy stir fried vegetable that goes perfectly well with roti or parathas. 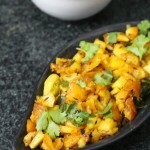 Here, I have used quite a few ingredients to make this everyday indian aloo roast which is a favorite among the kids and goes perfectly as an accompaniment with rice and khatti dal, palak dal, pappu charu, masoor dal, mango dal. Also try other veg stir fry vegetables such as karela fry or bitter gourd fry, carrot fry, vankaya fry or baingan fry, bendakaya fry, cauliflower fry. To make potato fry recipe as is mentioned in this recipe, the potatoes should be thinly sliced inorder to get the best taste and make the aloo cook well and soft. Potato fry goes really with dal and rice too and it is a simple recipe with some basic tempering given in the beginning. Different regions give different tempering and yet the taste turns out awesome…. Potato is one such vegetable which can be made into various forms be it as fried, baking or curry or gravy or it also works as a great combination to many vegetables like beans, brinjal, spinach and also to non vegetarian dishes like meat or sometimes in egg curries too. Firstly, peel the potatoes, wash and and slice them into thin slices. Take a wok, into it add oil and heat it. Add the cumin seeds and let them splutter. Add fresh curry leaves and let them crackle. Add the sliced aloo/potatoes and mix them well. Add red chilli powder and turmeric powder. 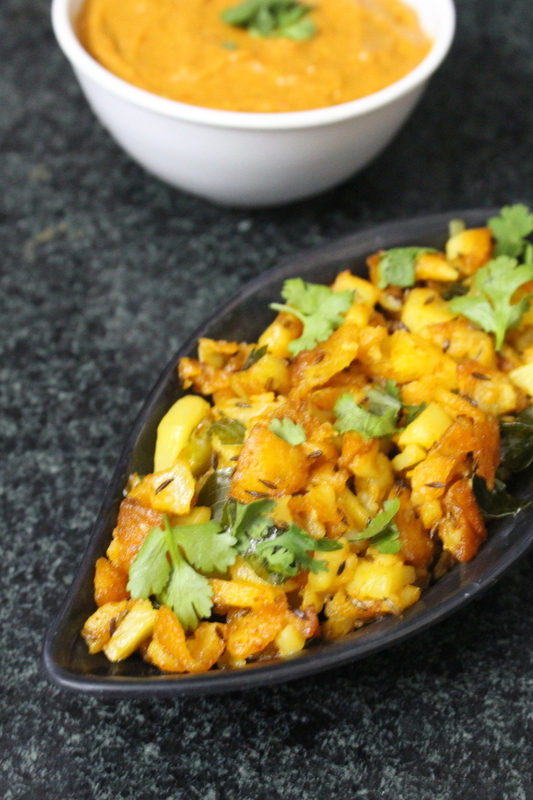 Mix everything well and keep stir frying until the aloo gets soft. Do not cook on high flame. Lastly, add roasted coriander seeds powder all over the aloo fry and toss it well. Cooking on high flame would burn the masala at the bottom of the base. Do not cook on high flame. Cook from medium to low flame. Potato fry looks delicious, thanks for sharing with Hearth and soul blog hop, pinning and tweeting. I have had this dish in restaurants but have never made it at home. 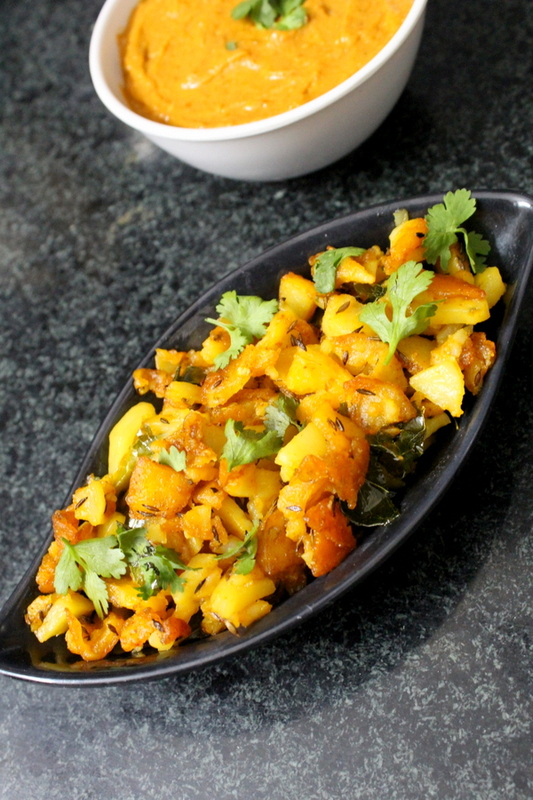 Your Aloo Fry looks so delicious! Thank you so much for sharing your recipe with us at the Hearth and Soul Hop. I look forward to giving it a try! I am very fond of potatoes so I can’t wait to make this! Thank you for sharing this healthy and delicious Potato Fry recipe with us at the Plant-Based Potluck Party. I’m pinning and sharing. Found this on the Plant-Based party linkup today and it looks delicious! I’ll have to look up curry leaves and see if I can find some in my green grocer, but I’ve already got the potatoes on hand.